But truth is great, too. What do we do when the two appear to be in conflict? But is this reliable as an M.O.? Are we actually equipped to do this consistently? 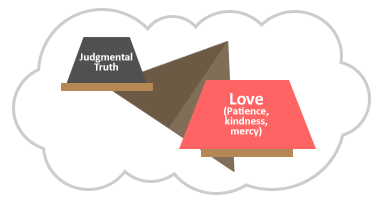 First, it’s important to dissect what “truth in love” actually means. The phrase comes from Ephesians 4:14-15. This is “truth against gullibility,” ferried by loving concern for the health of the church. It is a very specific kind of truth. It’s not an affirming truth, but a discerning or, more specifically, judgmental truth. It’s a truth that calls-out and puts-down and, as such, must be buttressed with love to avoid being discouraging or overtly offensive. This quirk is called validation-seeking. Our inner piping works with several different neurotransmitters, two of which are dopamine and serotonin. Dopamine is correlated with feelings of anticipatory excitement and stimulation; problems with dopamine are correlated with a bleak lack of hope. Serotonin is correlated with feelings of satisfaction and well-being; problems with serotonin are correlated with prospective anxiety and retrospective guilt. Excitement about prospects, combined with our desire to minimize past guilt and future anxiety, makes us extra-prone to seek self-securing “proofs.” We want external praise from bosses, loved ones, and even strangers, in service of a feeling of being “well-equipped” to tackle anything. When someone insults us, it stings precisely because it threatens our future. It can make us doubt our attractiveness or our intelligence or our knowledge — and we need attractiveness to charm people, intelligence to figure things out, and knowledge to know how the world is. Heaven forbid we are repulsive, stupid, or ignorant! And these insults hurt all the more when they’re done in front of others. It’s one thing to feel like we have the “mining tools” to excavate whatever “gold mine.” That feels good. And when those tools are threatened, we react very poorly. But we’d also like to find that the “other person’s tools” are subpar, or that she can’t mine opportunities like we can. In other words, it helps our self-confidence when other people — especially those with whom we are not close — are revealed to have faults. The last sentence should resonate with most of us. It’s what makes gossip so addictive. It’s what makes “this generation stinks” narratives so stimulative to parent generations. It’s what cultivates “us-versus-those-idiots” political and culture warfare. When someone we don’t care about or actively dislike stumbles, we delight in it, as it validates our lives (our choices and character) through the invalidation of their choices and character. 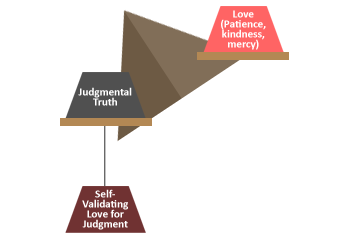 It matters because, thanks to these neurochemical patterns, there’s a hidden weight of “love for judgment” attached to the scale. 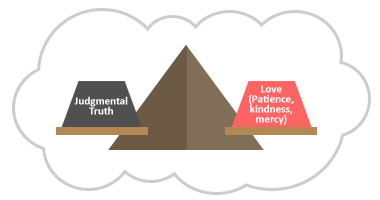 That is, whenever we try to practice “judgmental truth in love,” our secret “love for judgment” tilts the scales, and the “judgmental end” far outweighs the expressed patience, compassion, understanding, mercy, and tenderness. This is uncomfortable for us, because it seems like we’re loving too much. Our loss-aversive fear and worry of “excessive tolerance” and “slippery slopes” makes us terrified of how unbalanced we imagine the final expression will be. It’s not that Jesus didn’t care about virtuous behavior, it’s just that his M.O. was always “accept first.” He openly invited the “classic” sinners, as well as hypocrites with hidden sins, to rush in to the Kingdom of God. Niddling legalism and culture mores — even those declared universal, like Paul’s opinions about gender and hair length — must always be subordinate and subservient to the royal law of freedom. 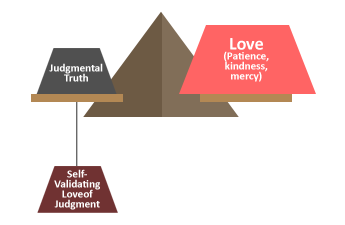 It’s one thing to recognize this “king love” hierarchy in the Kingdom of God. It’s another to express it. And to express it truly — to fight past the human propensity for self-validating hypocrisy and judgment — requires overwhelming love-driven practice. To hit the target with a weak bow, one must aim shockingly high.